”VIJAYA HOSPITAL” BELGAUM JUNIORS LEAGUE, a MegaCricket tournament for Boys Under–16 will commence from 8th November 2015 at Union Gymkhana grounds. The twenty five over’s a side event is organized by VIJAYA CRICKET ACADEMY Belagavi and the tournament is affiliated to Karnataka State Cricket Association, Dharwad Zone and will be held in format of Indian Premier League. The event is sponsored by Dr Prakash Patil, Director of Vijaya Hospital. 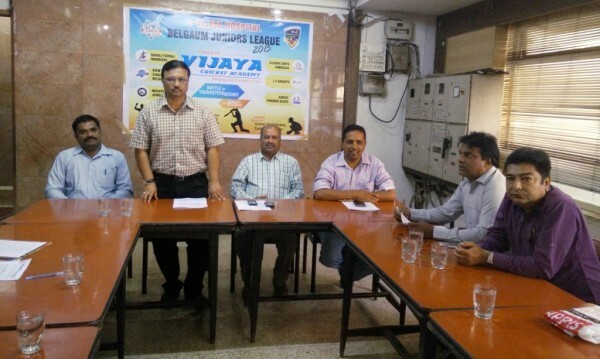 A total of six teams from Belagavi will feature in this event. Total of 102 Players from Belagavi District and six players from Hubli and Dharwad are participating in the event. It is the first of its kind event to be held in Karnataka. The matches will be played in colored clothing and with a white ball. The six participating teams in this BJL event are Sairaj Yuvraj Warriors, Mulveer Jewellers, View Challengers Belgaum, I-T Knights, Classic Boys Hindalga and Amrut Pharma Blues. In order to promote and nurture the existing talent and to provide a bigger platform for budding Cricketers of the District, Vijaya Cricket Academy has come up with this initiative through this event. Vijaya Cricket Academy received around 200 forms from players in and around Belgaum. 72 players were selected directly by previous year’s performances, 30 players were selected from 130 boys through a grueling selection procedure. 4 boys from Gokak were selected through this selection procedure. Selected 102 players were equally distributed amongst the participating teams. Total of 19 matches will be played in this 11 day event. Opening ceremony is on7th November 2015 at 5.00PMat Union Gymkhana. The matches will be played from8th November. Two matches will be played on each day. The Finals will be played on19th November 2015. 11th November will be rest day.